The mysteries surrounding the Bell Witch, located in Adams, Tennessee, have captured the interest of many individuals. When it comes to supernatural based stories in the United States, the Bell Witch is considered to be one of the most talked about events that have occurred in history that is directly related to an apparent spirit. There are many different versions of the story surrounding this apparent malicious spirit. However, there are many facts that remain consistent, one of which being that the events were documented and really occurred. Here, you will learn about the mysteries of the famous Bell Witch. In the year of 1804, a hard working farmer wanted to provide a better life for his family. Despite the fact that they lived in North Carolina, the farmer discovered an opportunity in Robertson County, which is located in the State of Tennessee. The farmer’s name was John Bell. Their new home was perfect for a fresh start and a hopeful future. The land that they moved onto was approximately three hundred twenty acres. The soil was fertile and perfect for growing crops. Additionally, it rested against the famous Red River. Little did the family realize that this was the beginning of the end. The family moved in and settled down in their new home. To most, their lives would be described as "quiet" or even "peaceful". They became active members of the church in the area called the "Red River Baptist Church". John Bell advanced to the position of "Deacon" while attending the church. For an amazing thirteen years, they lived perfectly normal lives. The land that they lived on served them well. They had many successful crops and were able to thrive financially. Towards the end of the summer in the year 1817, the peaceful lives that the Bell family had grown accustomed to would quickly change forever. As the family moved around the property that they lived on, they began to see very unusual living creatures. Not too long after noticing these animals, they started to experience hearing scary sounds of knocking in which no explanation could be offered. They contended with these sounds and many other unusual events for a period of a year, but after that year passed, they broke the silence on the complications that were terrifying them. John Bell turned to his trusted neighbor and close friend, James Johnson. At first James was shocked to hear about the events, but when he and his wife spent the night in the Bell home and experienced the events firsthand, they knew it was time to get more people involved so that they could assist the family. Eventually, the apparent spirit that was haunting the home gained enough energy that it could interact with the living by voice. It was then that it stated that it was named "Kate Batts". 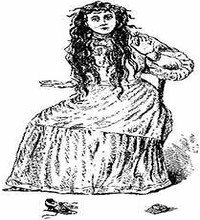 The individuals in the community quickly named the troublesome spirit the "Bell Witch".